In early February, USD continued to decline against the Swiss franc within the long-term broad downward trend. Since February 8, the pair sank more than 250 points. After that, the instrument reached a key support level of 0.9185, which is the lower border of the current long-term downward channel, fended off and swiftly went up. During the current trading week, the upward momentum only increased due to the growth of investment attractiveness to USD. 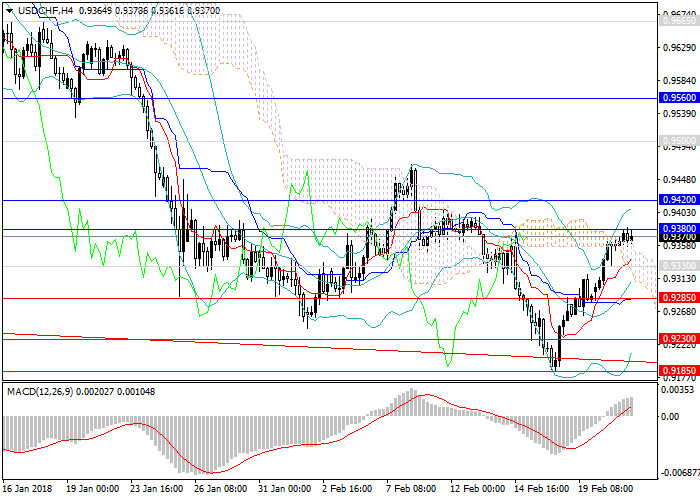 Today, the pair reached the first strong resistance level of 0.9380 and consolidated below it. By the end of the day, FOMC minutes will be published: optimistic comments and prospects for the US economy can give additional support to the dollar. In the short term, the growth of the pair is expected due to the strengthening of USD rate to the next strong resistance level of 0.9420. If the pair takes this mark, it can change the trend towards the ascending one with targets at 0.9560, 0.9700, 0.9850 marks. Such growth can be considered as a long-term correction within the long-term downtrend, the upper border is the level of 0.9850. At the moment, investors are more likely to buy USD due to it's oversold and high probability of recovery. Technical indicators on the H4 chart indicate the possibility of changing the trend: MACD shows a growth in the volume of long positions, Bollinger Bands reversed up. Support levels: 0.9330, 0.9285, 0.9230, 0.9185, 0.9100, 0.9030. Resistance levels: 0.9380, 0.9420, 0.9500, 0.9560, 0.9700, 0.9850. In this situation, long positions may be opened at the current level; pending orders can be put at levels of 0.9330, 0.9285 with targets at 0.9560, 0.9700 and stop-loss at 0.9160.